**Warning** If you haven’t seen Fight Club (which is kind of old by now), I’m going to spoil certain bits for you. 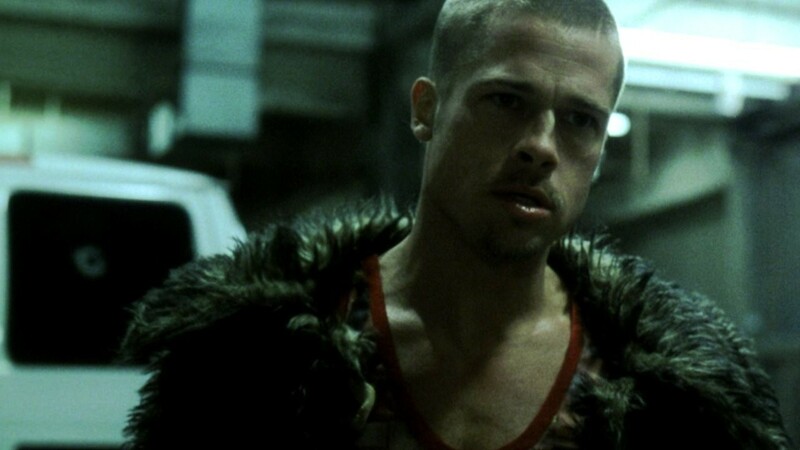 Maybe instead of reading today’s post, you could go rent Fight Club, watch it, and then read today’s post. The first time I saw the movie Fight Club was September 10th, 2001. I know this without hesitation because when I woke up for class the following morning, my roommate got an instant message from his boss telling him not to come in because large financial institutions were being bombed and planes were falling from the sky or something like that. If you have seen Fight Club, you’ll know that the movie ends with the bombings of large financial institutions. I was sure that my roommate was putting me on. When he showed me the instant messages, I was sure that somehow, his boss had heard which movie we saw the night before and he was putting us both on. I didn’t have much time to ponder this though, as I had a class to get to. After biking across campus, I showed up to my class only to find all of the students and the professor standing in the hallway, staring up at the television that normally cycled campus news and music videos. Instead, the footage showed a smoking, not-yet-fallen World Trade Center tower. The class never met. The professor sent us home and told us that classes would be cancelled for the rest of the day. And so, my memory has forever linked the fictional work of Fight Club with the real-life tragedy of the 9/11 attacks. And how I remember the tragedy is shaped by the motivations of the characters in the movie. To me, the terrorist group did not simply choose to attack the World Trade Center arbitrarily. They were motivated by a desire to bring down an example of American consumerism and the American way of life, similarly to the motivations of Project Mayhem from the movie. In this way, I can put their actions into the framework of a story rather than a random act of terrorism. This is just one example of real-life intersecting with and being influenced by fiction. And I only mention this example because of the significance of this day. But I can think of many more instances of fiction influencing my interpretation of reality. I believe that it is an entirely human thing to assign a story to a situation where we have limited information. If I were to say that a woman is crying, there is a chance that you have already thought of a possibility of why that woman is crying. Perhaps she is injured, emotionally or phyically. Maybe she is overwhelmed with happiness and the tears are for joy. You don’t have enough information to know the exact reasons, but you do have enough to create a story in your head. I think that the stories that we comes up with to explain the world around us reveal much more about us than they do the world. And often, the stories that we create are influenced by the stories that we consume, which lead back to our preferences for the how we interpret the world. If you seek out books about paranoid characters, you show that you have a penchant for paranoia, and there is a good chance that your interpretation of the woman crying has something to do with the source of your own personal fears. What do you think? Do books, movies, and stories in general influence your perceptions? What memories are you seeing through the lens of something fictional? I’d love to hear your responses. ← I am a good/bad student. Fascinating perspective. I agree – our stories are intertwined with our realities. I think what we call “reality” is quite literally the Largest story of all – the story of us, of our world or our universe. The stories we write and project are all ripples from that Larger one. At the beginning of the film, the term “controlled demolition” is mentioned, which is how the twin towers were brought down on 9/11. Also, near the end, the term “Ground Zero” is used, which is the site of the WTC towers. How eerie!